As I mentioned before, we just returned from our first trip to Disneyland! We did do more than just the Mouse while we were out there - quick trip through LA, Malibu, Ronald Reagan Library in Simi Valley, Legoland, San Diego, La Jolla - it was definitely a whirlwind trip! For the first five nights of our trip, Disney's Grand Californian Hotel (GCH) was our home base. 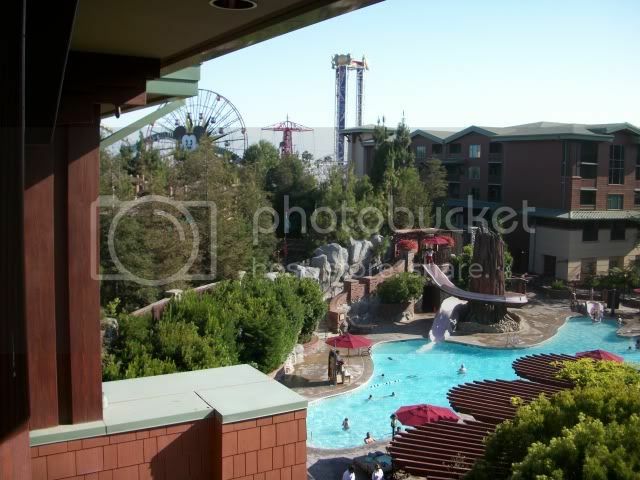 We had considered non-Disney hotels while in the LA area since Disneyland is right in the middle of town and surrounded by hotels, but Disney offered a great deal this summer - pay for three nights, stay for five. It brought the GCH down closer to what we would pay at an Embassy Suites or similar, so we chose the GCH. Boy, we were NOT disappointed! The GCH was designed by the same architect who designed both the Wilderness Lodge and the Animal Kingdom Lodge in WDW, and you can see some similarities in the designs, such as the impressive lobby (see pic below). Unlike the two Florida resorts, the GCH is designed in the Craftsman style that is so prevalent in California. Like WDW, DLR also bases room rates on the view from your room. The primary room views are standard (overlooks front entrance), pool view, Downtown Disney view and Disney California Adventure (DCA) view. We booked a standard view room, and to our surprise, we were told at check in that we had a 4th floor room with a pool view! Love free upgrades. And to make things more fun, we were able to see part of DCA from our room as well if we looked to our left. GCH's pool complex is expansive. There are three pools and two hot tubs. 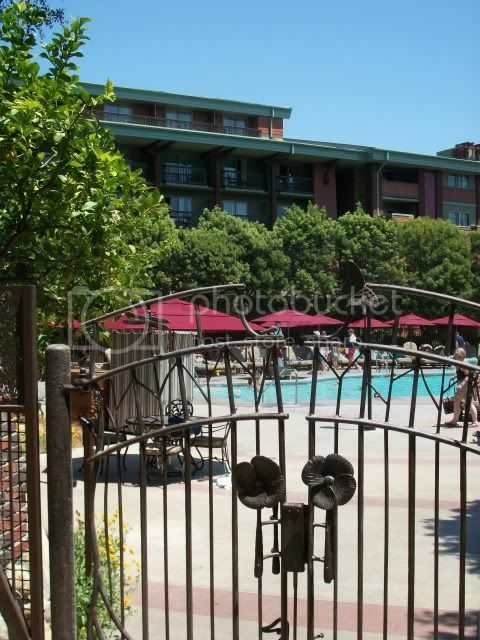 The pool in the picture above is also home to the Redwood Slide. The slide is only open during the day, as it is manned by a lifeguard. At night, the pool complex is dimly, but safely, lit. Cabanas are available for daily rental. During the day, there is also chairside food service. Another difference between all pools at DLR versus WDW is that they are gated with restricted access. One must slide a room key to gain access to the pool - see gate below. Once in our room, we were pleasantly surprised at its size. The rooms were larger than what we had at the Wilderness Lodge, but they were not as large as the Polynesian or Contemporary. We had two queen beds, flat screen TV mounted above a dresser, as well as two chairs and a writing table. Outside on the balcony, there were a few chairs and a small table. The decor continues the Craftsman theme with very little obvious Disney influence. 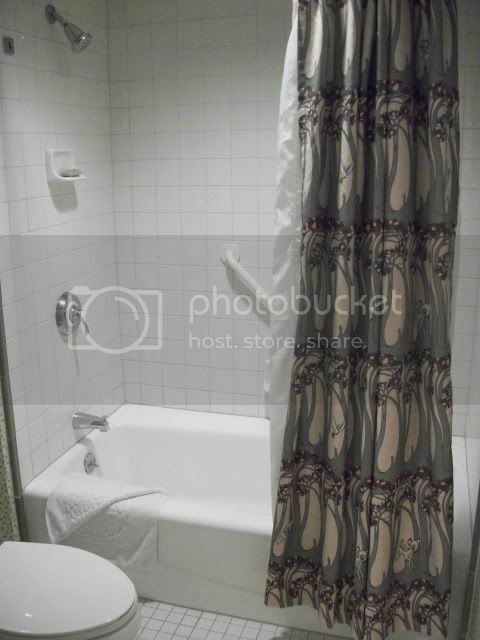 There were Mickey heads on the carpet, and there was Bambi and Thumper on the shower curtain. The dresser hid a small dorm fridge. One of the best features of GCH is its proximity to both DLR parks. Our room was essentially four floors above the private entrance in to DCA! While this entrance is available to all current guests of any of the three DLR hotels, few can say that it only took them 5 minutes from room to park! Going to Disneyland Park itself takes a few minutes longer - walk out from the hotel in to Downtown Disney, swing a right, and tada! You are in the promenade between the two parks. GCH's proximity to DCA is proving to be a bit problematic with the new World of Color show. Currently, there are three shows a night, and it is LOUD. The rides you see in the picture are in the Paradise Pier section, and WoC plays out on the lagoon in that area. Even though we were not overlooking DCA and were actually a decent distance away from the lagoon, we could still hear the music during the shows, even with the doors closed to the balcony. Luckily, it was not loud enough to keep us awake at night, but we both commented that it had to be loud in the rooms that overlooked the park on that side. We experienced two of the three dining options at GCH. Whitewater Snacks is the quick service location, and we ate dinner there our last night of our stay. 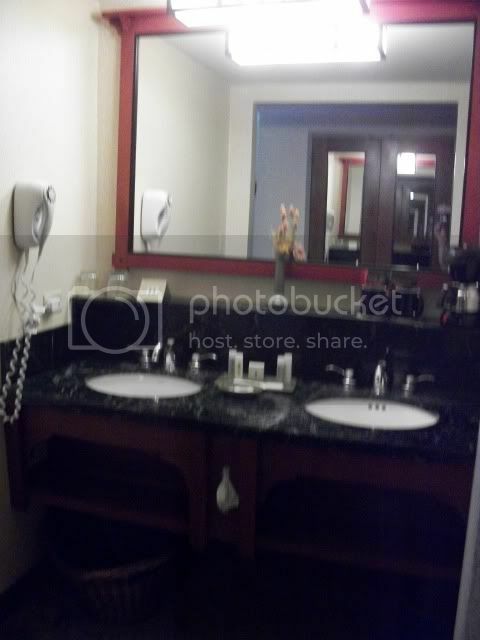 We found it to be better than average as far as Disney hotel quick service goes. We also had dinner one night at Storyteller's Cafe. Three of us chose their buffet, while E Belle ended up with standard chicken nuggets. The buffet had a carving station, salad, desserts, pasta, vegetables, etc. Pretty decent, we felt that we got our money's worth considering we left stuffed! Napa Rose was the only one we did not try, is considered to be the nicest of all DLR restaurants and serves California style cuisine. I am so glad we chose GCH! I'd stay here again in a heartbeat. 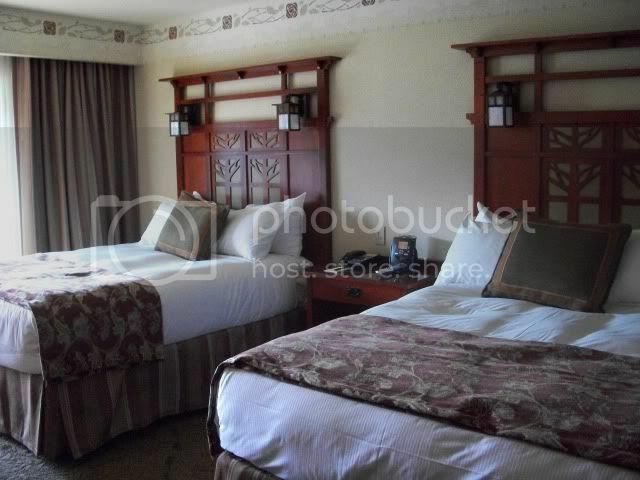 While it is definitely more expensive than most rooms on Harbor Blvd., it is still cheaper than a deluxe room at WDW. Free Dining had been extended at WDW! Old Key West is being renovated!